Welcome to patch 6.6, the one where we buff Kha’Zix. There’s lot of other changes, but this one goes out to all you Bug Catchers out there. Oh, and there’s a space dragon if you’re into that sort of thing. Maybe you’ve heard of him. He’s kind of a big deal. Rather than hammering in all of our changes, we figured we’d shop around for some better ideas on how we want to talk about some of our more outrageous outliers. While 6.6’s got a lot going on, let’s highlight the ones getting the most love: a group we’ll refer to as specialists. These champions are the strategic role-players - the niche pick flavor packets that bring a whole lot of intention to the team composition noodle bowl(or maybe they’re the ones creating a strategy stew all their own). What we’re trying to say (aside from being hungry), is that these specialists have very high strengths that often define a team’s strategic identity. In exchange, however, they typically have stark weaknesses that can be capitalized upon. This is where the generalists we were talking about last patch come in: with their subtler weaknesses (and strengths), generalists usually serve to enhance the flavor of the specialist without also introducing additional tastes. Food talk aside, we’ve got the usual buffs and nerfs below, but we’ve also shifted more of our focus to the pro scene, as we begin taking a deeper look at what’s causing such slow starts. As such, you won’t see any changes to death timers or early towers/dragons (yet), but we’re not turning a blind eye to the woes of the pros just yet. Consider this patch us dipping our toes into the pool before diving in head-first. And that’s all for us this patch! We look forward to seeing how you spice up your team-composition dishes, be it through a Shock Blast of poke-sicles, Salted Mantras, or simply turning back time and trying all over again. Whatever champion stew we’re brewing, you can count on it tasting like fear. Soldiers no longer apply Fervor of Battle. So this interaction was removed in 6.5, but slipped our patch notes. While Azir’s soldiers look like they’re basic attacking, they’re not applying on-hits. Sand Soldier attacks are treated as spells, and as such, apply spell effects like Liandry’s Torment or Rylai’s Crystal Scepter. For people that knew how this interaction worked (for as long as it did), Azir could actually be dealing more physical damage than magic. That’s not a particular can of ascended worms we’re willing to balance around - on top of the fact that this shouldn’t work anyways - so it’s gone. R stacks provide more health. Cho’Gath isn’t far below the bar, but life’s still hard for a void dinosaur-terror with lobster claws. Cho’Gath has the power to wreck an entire team given his powerful CC… or die horribly, beginning an almost never-ending game of catchup to restore the health stacks he so desperately relies on to function. We’re easing up on the build-up (especially late-game) for a voidbeast fallen on hard times. Passive deals less damage, but scales higher early. E slow and range down. Stop me if you’ve heard this one before: a high-damage carry champion builds primarily tank items and still manages to deal enough damage to duel everyone while being impossible to take down. It’s a problem as old as League itself, but these days Fiora’s become the posterchild for game health issues when Tanks and Carries cross the streams. It’s a standard problem, but also one that’s often misunderstood - it’s not the damage that Fiora (or any carry) does, it’s the whole ‘not making a tradeoff to get it’ that’s an issue. E bonus damage and R disable time down. From a holistic, top-level view of League, Janna’s role as a protector fits rather well into the eternal rock-paper-scissors of ‘tank-carries-assassins’. The issue (as is always the case whenever Janna’s too strong) is how well she can protect. At present, Janna’s strengths are shutting down not just divers and assassins, but almost any aggressor there is. We’re pulling back on some of the extraneous power she provides when enabling counter-engages while ensuring her ‘keepaway’ style of disengage is intact. Hammer Q's cost reduced. Base damage and ratio increased. Another niche pick, Jayce has been on the cusp of widespread play for a while now. We’re not touching his poke where he’s already a strong contender, but tuning up Jayce’s ability to follow-up that poke (or create lane presence) with a hammer. The mechanics of this can be a bit complicated, so let’s break down what’s happening. Currently, Lux gives a shield for her allies, and then immediately rewrites that shield on return. This means that in a vast majority of cases, you’re only giving one shield - since the first one you gave was refreshed almost immediately. With this change, not only is it easier to actually hit your allies, but they get more benefit when you do! That’s the good news. So it’s all pretty good for Lux. Unless you’re the Lux, in which case you now have a worse shield that takes longer to get to you (that’s the bad news). What gives? Well, Lux’s safety, damage, utility and range are all top-notch. Readers of the patch notes may look at that list and say ‘Hey, that’s a lot of strengths’. And you’d be right - rebalancing the shield is our chance to give Lux an actual weakness to all-ins and assassins without removing the reasons to pick her entirely. Now Lux will just have to play a lot more carefully and patiently around those incredible ranges she’s packing if she expects to get the same results as before. Base Magic Resist up, and Magic Resist scaling introduced. Sapling duration up. Maokai’s seen a heavy drop in play since his dominance throughout 2015, surprisingly absent in an environment filled with his other tanky brethren. We’re going easy (as Maokai has a tendency to overcentralize the playing field when too strong), instead focusing on the key areas where he brings utility to his team. It’s also worth noting that Maokai is the last tank left in the game without scaling Magic Resist. It’s a dangerous proposition, but one that we’re embracing as we adopt a ‘wait-and-see’ approach in the event that this flings Maokai too far from the tree. newTREE’S A CROWD Saplings no longer stack on top of each other. Instead, they shuffle a short distance away from one another. Hunting monsters no longer roots them. W's damage increased, but basic attack reset removed. Speaking of champions with lots of strengths and few weaknesses, we come to Nidalee. Nid’s potency in professional leagues around the world is warping diversity to the point that she’s a must-pick or must-ban in most situations, thanks to her incredible versatility and objective control (what scuttle crab?). We’re lowering Nidalee’s ability to run circles around the competition with a lead in pro play without significantly impacting her performance in normal play. ON THE BALL Fixed a bug where Command: Attack had a smaller AP ratio when moved very short distances. Q's scaling reduced at early levels. Shyvana’s too strong. So what are we going to do about it? While the below changes might not look like much for anyone that’s been mauled by the half-dragon lately, Shyvana is a champion that we define as high-variance. That is to say ‘She’s okay to rampage through a neighboring lane (or village) because Shyvana can’t do that every game’. This isn’t just about risk vs reward or winrates - variance is the other side of the coin of reliability, describing a champion’s spread of being able to achieve certain outputs over time. To break that down, let’s use examples. Amumu can sometimes land 5-man ultimates - or he can whiff entirely - creating a high variance champion. By contrast, let’s look at Kayle’s Righteous Fury. No matter what you do, it’s always going to give you a buff to your range. Does what it says. There’s still some variance at play (was this the right time to use it? ), but it’s pretty low-variance overall. The below changes (combined with Titanic Hydra’s changes further down) represent our viewpoint that to attack Shyvana’s power level, we have to affect that variance. 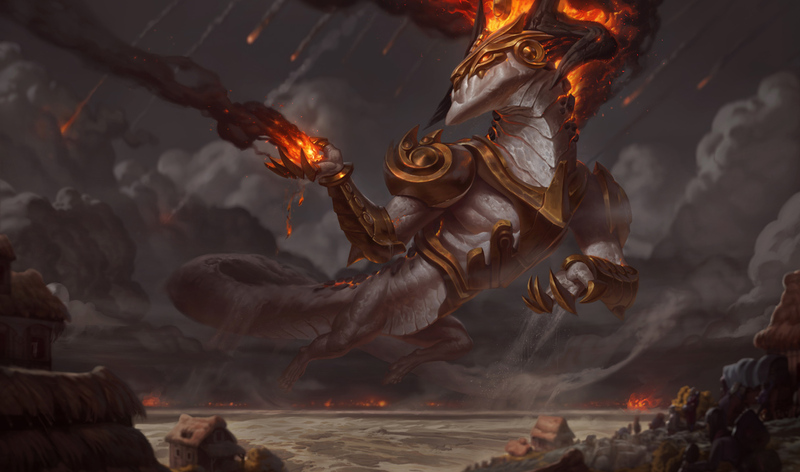 Lowering her damage in the early stages, especially when dueling champions, should see a stunt in that growth from ‘always on’ to ‘sometimes on’ as her opponents seek to close the gaps in her flame horizon. Underworld skin visuals are more readable. W card picker standardized across skins. Though it might seem appropriate for a card sharp like Twisted Fate to employ underhanded tricks, he shouldn't be relying on hard-to-see visual effects. Underworld Twisted Fate was a triple offender: his cards blended into the environment, were smaller than the other skins', and his Wild Cards spun the wrong way (look at the edge of a card - it's just a line). Skins should be fun, alternative fantasies, not competitive advantages, so we're addressing these issues. While we were working on skin consistency, we went ahead and standardized TF's Pick a Card... picker. Unhovered cards are now always darkened, making it easier to follow the active card as it cycles and better communicating the order the cards cycle in. PICK A HAT The overhead indicator for W - Pick a Card has been standardized for Twisted Fate's base and all skins. The two unhovered cards are now darkened instead of transparent. Runic Echoes is supposed to realize the fantasy of having a scaling AP champion from the jungle, but a disproportionate amount of buyers transition into heavy tank items after the purchase. Echoes into defense items isn’t a build we’re opposed to per se, but the current tuning is more beneficial for tanky champs that can proc it multiple times in a fight.. Mages still have a scaling ‘hit-and-run’ jungle item, but when Nautilus, Amumu, Maokai (and even… Hecarim?!) are buying this to the exclusion of other enchantments, you know there’s a problem. Recipe changed. Attack damage lowered, but now has passive cleave again. Back in 5.22, the thinking was that by making Tiamat a cheaper item (while still building out of the amazing Pickaxe), we could see it bought for its laning benefits rather than being the item that you power-spiked off of. What we saw was actually the opposite - many laners and junglers (Kha’Zix, Jarvan, Renekton) alike struggled with the pushing or clearing capabilities of the old Tiamat. Now that we’ve lived in a world without Cleave, we’re trading stat-efficiency to bring it back to the people who need it most. Build path is less ugly. With the lower attack damage on Tiamat, we realized we could make the build smoother by subbing out the Long Sword for a Pickaxe. If you’re someone that plans on basic attacking in League of Legends, Titanic Hydra has a lot of upside. Health scaling on-hit damage, waveclear and a basic attack reset? (Shen nods silently in approval) It also has a lot of attack damage for such a bulky item, making it the better purchase for champions looking to burst you down than its ravenous counterpart. Tuning down the stats to be less appealing as a ‘generalist damage item’ means we can retain Titanic’s unique effects for the tanks that rely on it to become relevant threats. 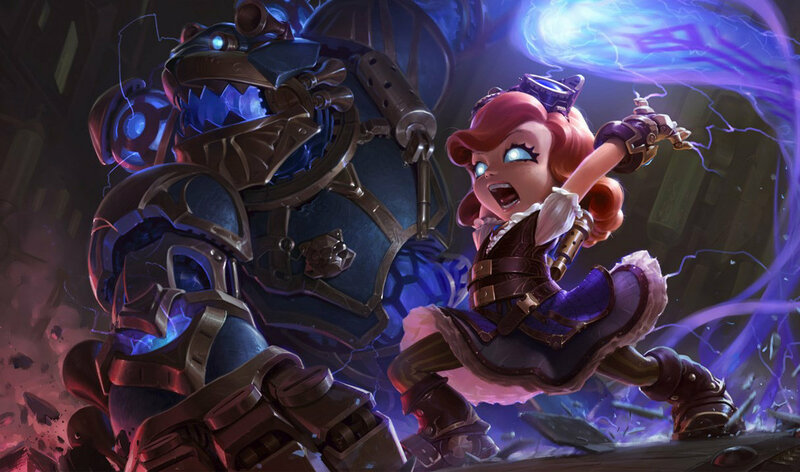 Hextech Annie has been added as loot. Regional system rollout continues. First off, we'll quickly mention we're aware of a bug where key fragments aren't dropping after matchmade Treeline or ARAM wins. Fixing that is on our list of things that need to be done before we can consider Hextech Crafting fully launched, and we're working on a solution for an upcoming patch. That aside, we've added the exclusive Hextech Annie skin to Hextech Crafting! IT TAKES 10 Unlike other skins, Hextech Annie can be forged by combining 10 gemstones! When 6.6 is released, you may notice a bug where custom game lobbies sometimes forget to show you the invite button. We'll get a fix out ASAP, but in the meantime, you can force the invite button to appear by switching teams. Sorry!